Start your day proper with this delicious and highly nutritious chocolate oatmeal smoothie. Yes, you can have chocolate for breakfast! Oatmeal is a popular and healthy breakfast option. You can take your oatmeal to a whole new level of flavor and nutrition by blending with a few choice ingredients. One of those ingredients being one of my all-time favorites, cacao, or raw chocolate. Soak 1 cup rolled oats in 1 cup water and 2 tablespoons acid (lemon juice, liquid whey, apple cider vinegar, or yogurt) for about 8 hours. Soaking overnight is convenient. Add another cup of water and 1/2 teaspoon sea salt to soaked oats, stir, heat to a low simmer, and cook for 5 to 10 minutes. Consume with liberal amounts of butter and cream or toss into a smoothie. To save time prepare 2-3 cups at once and refrigerate for use over the next week or two. For those of you that don’t know I have a serious weakness for chocolate. I just can’t seem to keep it out of my smoothies no matter how hard I try :) Hope you enjoy this recipe as much as I do! I’d love to know if you try this chocolate oatmeal smoothie and how you liked it. Please leave a comment below. Happy Blending! I’m concerned about the sugar level of many of the smoothie recipes I’m looking at. Aren’t we concerned about reducing sugar intake or is it OK because of where the sugar is coming from? I can’t imagine a decent tasting smoothie without some sweetness to “hide” the bitter taste of many of the ingredients used but are we just fooling ourselves about the health aspects? I’m not trying to start an argument, just trying to understand as a newbie. Thanks……. The only sweeteners I recommend are honey, maple syrup, and stevia. These are vastly different from table sugar and the plethora of laboratory produced synthetic sweeteners. There are other viable natural sweeteners such as molasses and coconut sugar, but I don’t have much experience with those and therefore don’t recommend. As for my opinion I think that the count of the sugar in fruit is not worth counting because of the nutrients fruit contains. If you are truly concerned on the Weight Watchers they have a hole article about your concerns. Thanks for the informative comment, Jacque! I am not a fan of extra sweeteners in a smoothie – but taste is personal of course. I am not sure how leaving dairy out of the recipe affects the nutritional breakdown, but I like the taste of chocolate with almond so I also soak 8-10 almonds overnight and add it to Ryan’s recipe, but leave out the dairy. I also substituted raspberries for frozen cherries. It’s amazing tasting – chocolatey but fresh! Thanks for giving us a variety of tastes and ideas! Leaving the dairy out doesn’t significantly affect the nutritional breakdown. Soaking almonds overnight is a good idea. I’m going to do that tonight :) Frozen cherries are a great substitute for raspberries. Nice to see you’ve made this smoothie your own. I have been using SweetLeaf Stevia. It does have Inulin insoluble fiber which apparently has some controversy swirling about it. But at least it’s not another sugar per se. I understand some call it “diabetic sugar”. Last item….. I picked up some cacao nibs and find them a very interesting addition to my smoothies. If I remember to grind them first, you simply get a nice rich chocolate flavor, but if I throw them in with everything else when making a smoothie sometimes there are little bits left that are nice to sort of chew on when you catch one. Adding some cinnamon with the nibs really kicks up the “yummy factor” at least for me. I’ll start with a recipe as sort of a framework and I just can’t help it but I always end up making modifications on the fly. As I’m learning what goes well with what, I’m getting some interesting combos, but I never write them down….lol. Maybe I’ll try to remember and post some of them. I can say this — none of my smoothies are ever the same!! 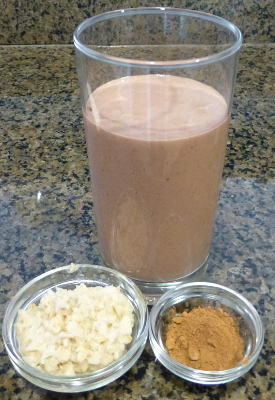 I always enjoy a few cacao nibs to chew on in my chocolate smoothies that I also add cacao powder to. Chewing your smoothies is a good thing – improves digestion. I don’t mind small chunks of frozen fruit or coconut flakes either. You’ve certainly embraced the art of smoothie making. My recipes are meant to be templates for creating your own unique concoctions. Feel free to share some of your favorite self-created recipes in comments on my site or via email. I’ll even post a few of your recipes on my site. Always looking for new ideas. Hi…I’m from the Caribbean. Could you please help me with at least 6 smoothie recipe that i could use for a smoothie business? In my country persons seem to gravitate more to smoothies that are creamy (ice cream like). I am currently unemployed and want to do something for my own. Thank you. Being a long way from the Caribbean my recipes don’t call for many of the fruits and veggies local to you. Peruse my recipes and try substituting some of your local produce for the ingredients I often use that aren’t local to you. Coconut oil and avocado will be essential. You can use ice to chill your smoothies. I put baked apple chunks in all my smoothies, and it revs up the sweetness. Great idea, Barbara! Sounds delicious! Hi, I’m new here. Looking forward to trying out all these lovely smoothies. Welcome to the land of healthy smoothies, Alfred. Do you ever use steel cut oats in smoothies? I was wanting to cook up a batch & have in the refrigerator to add to smoothies. I would assume I don’t need to go through the soaking process if I’m using steel cut instead of rolled?? I have used steel cut oats a few times, Amanda. You should still soak them.